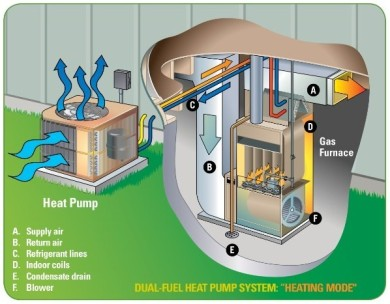 A dual fuel system is the combination of a heat pump with a furnace, usually propane or oil. The system will allow you to heat your home with the heat pump during milder cold days and will use propane or oil during more extreme cold temperatures. As an example, the heat pump system will run when the outdoor temperature is 40 degrees or above and automatically change to propane or oil when the temperature drops lower than 40 degrees. More efficient and cost effective. Burning gas or oil as your primary source of heat can be costly. Environmentally Friendly. This supports an economical utilization of energy. Electricity is utilized for the greater portion of time, about 85 percent. No pollution is associated with electricity usage. It is a clean system to use for home heating and air conditioning needs. A dual fuel system is a smart choice for your comfort, energy and budgetary needs. Interested in a Dual Fuel system? Have more questions? Call Bay Area Mechanical at 410-636-6400 today!